On Tuesday CTA announced the restoration of express bus service on Ashland and Western Avenues during peak hours. The CTA ended express bus service on the #9 Ashland and #49 Western routes amid budget cuts in 2010. The #9 Ashland route is the most popular bus route in the system with 10 million boardings annually. Today’s announcement is good news for transit riders who are forced to deal with overcrowding and slow, unpredictable trips on two of the most popular bus routes in the system. This decision should be a first step towards CTA building a true bus rapid transit (BRT) corridor on Ashland with dedicated bus lanes, improved stations, and enhanced sidewalks and medians. The CTA’s own analysis from 2013 shows restoring express bus service will result in slightly faster trips but nowhere near the speed of BRT. Currently, the average bus speed on Ashland is less than nine miles per hour .With express service and newly added traffic signal priority (TSP), the CTA projects it could tick back up to 10.8 miles per hour, or slightly faster. Buses will still be stuck in traffic during peak periods, however, and trips will remain unpredictable. The CTA found building a rapid transit corridor on Ashland could speed up trips to as fast as 16 miles per hour, an 83 percent increase over current speeds. The project would also result in predictability similar to a train, more efficient traffic patterns, and dozens of blocks of sidewalk and crosswalk enhancements. Recent downtown transit improvements should be welcomed but we can’t forget about our neighborhoods. Not everyone works in the Loop or is going downtown, which is the outdated premise behind the CTA’s hub-and-spoke system. 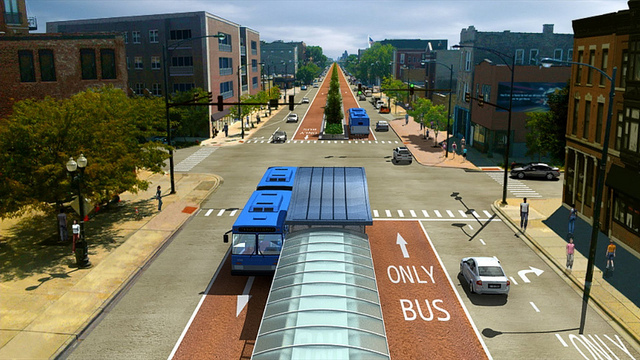 Ashland BRT would be the city’s first rapid-transit line — bus or L — that doesn’t go downtown, one that connects a dozen west side communities and to the CTA’s Orange, Blue, Brown and Green lines. As more Chicagoans choose to ride transit every year, it’s time for the city to invest in expanding the city’s rapid transit network to give riders faster, more convenient options. Restoring express service is only a first step, and implementing BRT must come next.